Have you ever met someone and immediately sensed that they were special right from the start? It’s as if the universe conspired to bring the two of you together and you’ve finally met your ideal match. Whether you realize it at the time or not, you’ve found your soulmate. A soulmate is a person who both compliments and completes you on every level. Whether it’s physically, spiritually, mentally, or emotionally, the two of you just click. The chemistry comes naturally and your lifestyles and personalities connect smoothly. A soulmate balances you out and no matter what you may be going through or facing in life, they always seem to understand what you need and where you’re coming from. You can count on them for help and advice, comfort and reassurance, friendship and love, and virtually anything else. 1. You both have similar dreams and goals that you’re striving for. Whether it be career, family, heath and fitness related or more, both of you are similarly aligned. 2. Your sense of humor matches and they have a unique ability at getting you to crack up. After a few days of knowing them you’ll probably already have a couple of hilarious inside jokes. 3. You love talking to them about everything and anything. No topic is off limits or taboo and you don’t hold back any embarrassing details or information for fear of being judged. 4. There is a refreshing, total and complete lack of jealousy on both ends because you trust in each other and are wholly secure in knowing what you have together. 5. You apologize and say sorry whenever you’re wrong or mess up and truly mean every word of it. You don’t fight them any further once you realize you messed up and they accept your apology rather than dragging whatever the situation may be out any further. 6. They bring out the best in you. Maybe they challenge you or don’t let you give up so easy and in doing so you end up accomplishing much more than you ever could have without them. 7. You always have each others back. They constantly cheer you on and encourage you to do your best, you stand up and support them in all of their endeavors, and vice versa. 8. You can read their thoughts and emotions like a book. No words are needed to convey what either of you may be thinking or going through, you just know and can sense what the other is feeling. That kind of completely silent intuition is rare to find, but soulmates share it. 9. You don’t lie to each other. Even if you tried they’d see right through your falsehoods and would call you out on it. You know each other too well and are so open and honest that lying just doesn’t come up. 10. They help you work through your troubles or any issues you may be having. A soulmate wants you to be your best and will work hard right alongside you to solve problems and get over hurdles in the way. They’re often a great source of clarity and keep us focused and centered in the confusing situations we face. 11. There is magic between the two of you when you first meet and lay eyes on one another. 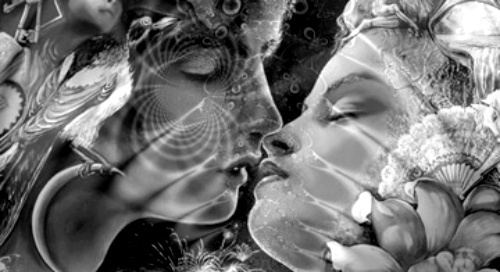 It feels magnetic, exciting, and you instinctively know at that moment that you’ve met your soulmate. Listen to what your heart is telling you and go for it!